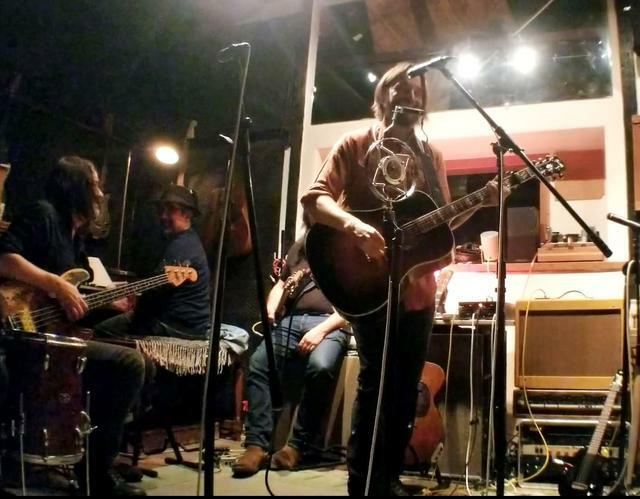 LA La Land: A private CD launch party in a renowned recording studio Reviewed by Patrick O’Heffernan on January 17, 2019 . (Los Angeles) It had stopped raining around 4 pm last Sunday when I squeezed my 10 year-old Ford Escape into a parking place on a residential side street in West Los Angeles near — but not too near — the Santa Monica Airport. I had been invited to a private CD release party at the home studio of legendary music producer Steve McCormick a couple of blocks away. Johnny Chops was releasing his new album, Johnny Chops and the Razors to, friends and family and music insiders. Others set to play were the Brazilian-born Jazz-Blues singer Monique Maion, and Steve and his wife, singer/songwriter Heather Donovan. There were about 35 or so people milling around a table set up on the back yard patio, chowing down on turkey chili, vegetables, munchies, and cookies – and of course a seemingly endless supply of wine plus beer and soda in the outdoor refrigerator. Steve gave me a tour of the studio, built in a freestanding, finished-out garage and packed with both vintage and modern equipment and the tube microphones he is famous for. 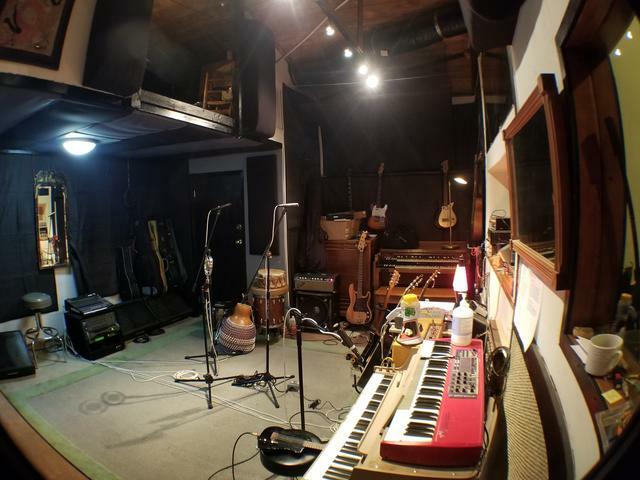 The space was small but had plenty of room on the carpeted studio for a band and space in the control room for Steve and at least three other people – if they knew each other well. McCormick has released six studio albums including his recent Stars and Chandeliers which was featured on my radio show last year. Always in love with Americana music, Steve even wrote his college thesis on the topic. He also picked up producing and honed his recording skills by working with tube microphone guru Steve McKinstry at the famed Salmagundi Studios. He has gone on to produce dozens of albums for artists including Phil Cody, Michael Sherwood, Amilia K Spicer, Tim O’Gara, and has worked with artists like Stan Behrens (Canned Heat, Willie Dixon), Eric Lynn, Richie Hayward (Little Feat), Stevie Di Stanislao (CSN, Joe Walsh, Loggins and Messina, David Gilmore). In addition to his albums, McCormick’s songs have been featured on NBC’s “Homicide”. 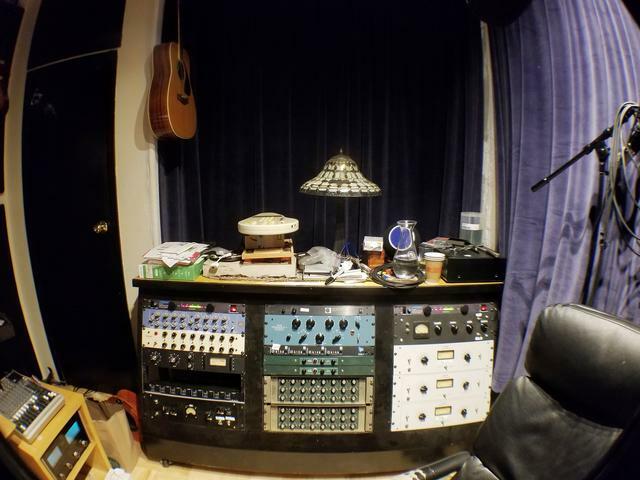 In addition to recording and producing, his studio also custom builds tube mics for artists who love their warm tone. Our co-host Heather Donovan called us into the studio for the music around 5:30, and we packed in knee-to-knee and shoulder-to-shoulder, wine glasses and beers in hand. The crush of bodies thankfully warmed it up quickly as the temperature outside fell with sundown (it is not always sunny and warm in LA). Although the studio was not well lit (at least for photography) we settled down at watched as the tall, glamorous Monique threaded her way through the audience, picked up a carbon body electric ukulele and let loose. I had never seen Monique before so I had no idea what was coming. What was coming was a short set of evocative, stomach-grabbing blues, contrasting perfectly with the high-note ukulele and backed by McCormick on one of his dozen or so guitars. I was impressed. I was hooked when she moved to a vintage electric piano and just wailed, pulling the strings of everyone in the room. She finished up with a bit of humorous blues delivered through a hand megaphone to give it the effect of a distant, almost disembodied sound. I sure hope she was being recorded. Steve shooed us outside for a break, drinks, and munchies while he set up for the next set – himself and Heather Donovan. When we piled back in, the crowd seemed larger, and I guess it was because their 2-year old son was present along with the grandparents who had come over for their grandchild’s birthday and to catch the music. Steve and Heather delivered a half dozen lively Americana tunes including their iconic Lying On The Bottom (of the Mississippi River). Although Steve did switch from electric to an acoustic guitar at one point, the studio was not set up for his killer slide guitar playing or his blistering Santana style lead guitar work. I still loved it. Between songs, Steve reminded us that the duo is currently named “Maplewood” after a local street, but Steve said he wants to change it asked for suggestions for a new name, preferably only two words. Suggestions poured forth; we shall see. The highlight of the evening was Johnny Chops, an Austin-based, down and dirty soul-soaked blues rocker whose tours fill venues from coast to coast. He has been on my radio show, but I never got to meet him in person – it was a pleasure to not only meet him but to sit about 2 feet away from him as he gave us songs from the new album. He also threw in bonus covers of Delbert McClinton’s “Two More Bottles of Wine” and Bill Withers’ “Use Me”, plus “Prayin for Rain” from his earlier album Sticks and Stones. Backed up by McCormick and a bassist and electric piano player, Chops lived up to his name. There was no room for dancing, but plenty of people thought about it, especially during “Rock Bottom” and “Ten Cent Talkers”. Even though I reviewed his earlier album Sticks and Stones, I did not realize the boatload just plain fun he can bring to a room in his live performances. I do now and will catch him anytime he is within 50 miles of LA. Johnny wound down and the party wound up again as folks trickled back to the bar and picked up earlier conversations. I hung out with Johnny and Steve and Heather for a while, took another quick studio walk around, and said goodbye to friends old and new. Fortunately, the rain was still stopped as I walked back to my car, plotting to get Steve, Heather, Monique and Johnny on my radio show.